Marinades, glazing or just like that. Suitable for all grilled meat! Jävla Sås Bolag crowns the dish and the chef. The uncrowned king of sauces. Our version of a classic barbeque sauce without all the unnecessary additives or flavorings. Jävla Sås Bolag Classic BBQ Sauce works wonders in marinades or glazing, as a pizza sauce or even to spice up your chicken pasta. 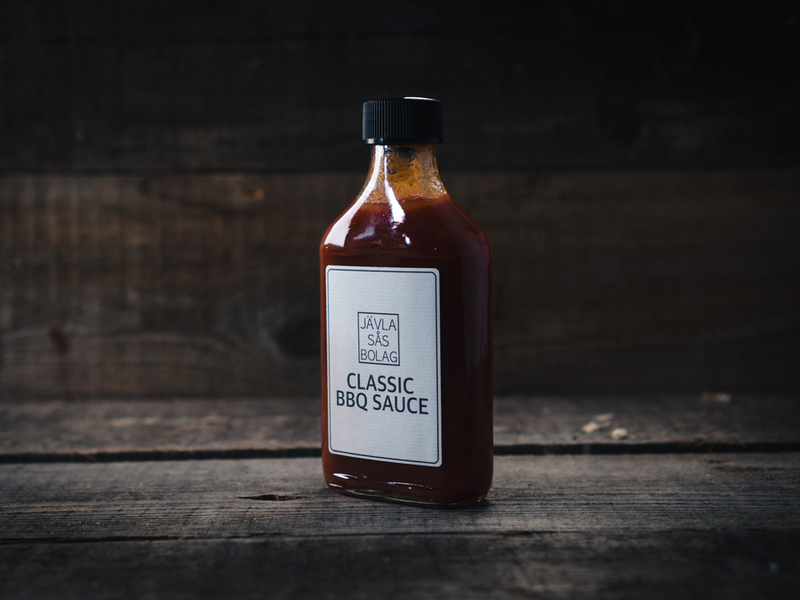 Jävla Sås Bolag Classic BBQ Sauce is the perfect sauce for all grilled meat. Let your imagination run wild with the Jävla Sås Bolag Classic BBQ Sauce. INGREDIENTS: Water, Syrup, Tomato Sauce, Pasteurized Tomato, Brown Sugar, Salt, Vinegar, Smoked Pepper Powder, Garlic Powder, Black Pepper Powder, Mustard Powder, Thyme, Potassium Sorbate (E202).